Take a few deep breaths. Breathe in through your nose and out through your mouth. Become aware of the night around you, listen to the noises of the dark. You see a path stretched out before you. It is illuminated by a lantern held in your hand. It is a familiar path. Step onto it. As you begin to walk forward, become aware of the path beneath your feet. It is made of dark black stones of obsidian..... In the light of the lantern the path glistens silver. Travel down this path, down ....down..... deeper and deeper.....walking along the path....until you come to a crossroad. Here at the crossroad Hecate awaits you. Here at the crossroad you can see, sense, or feel the Ancient One, the Crone Goddess standing in front of you. She holds out Her hand and you take it. Here at the crossroad, where the path that you are one is met by two intersecting paths, you have a choice to make.... All paths reach out to you. Which one will you choose? They are all enticing and all promise something that you need. They all sparkle and shine before you. Ask Hecate for help in choosing. Take a deep breath and feel the vibrations in your body......... .Feel the energy of the Earth Mother. The winds envelope you, and you begin to fly with them. They take you swinging from side to side, then up, up, up. Hecate flies with you, higher and higher. She suggests that you notice the paths below you. The crisscross patterns of shining silver threads spread out below, like a large web. Many paths, twisting and turning, as they cross and re-cross each other. A giant web that is your life path. Thousands and thousands of tiny paths, crossing and forming the patterns of your life's choices. Tiny lines now, as you float above them. They seem small and insignificant, just paths, just possibilities, just choices. As you look around, you see other webs all around you..... Some threads passing right through your web, some close enough that you could reach out and touch them. These are not yours to walk upon....... As you float above your web, you see that these paths that are ever so close to yours, are someone else's paths to walk. The winds die down and you gently float back towards the ground. You are back at the crossroads with Hecate. Hecate takes your hand and leads you back up the path of obsidian, up....up....up the path you walk, feeling energized and relaxed.....feeling calm and centered. With each step you feel the Earth's energies mingling with yours, until you reach the end of the path. Back where you started. 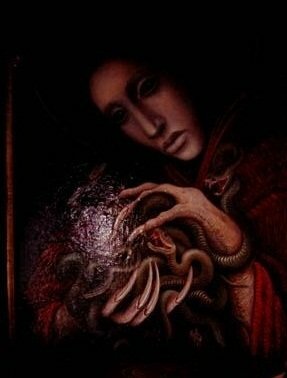 Hecate embraces you and you thank Her for the gifts of perspective and clarity. You give Her a token of gratitude. Take a deep breath and as you exhale start to bring some awareness back into your body. Take a few more deep breaths.....when you are ready open your eyes.